The Super Bowl LIII is all about the snacks and the commercials (and maybe the Rams vs Patriots game), so awesome snacks are a must-have! Whether you’re watching the game at home with just your family or you’re planning on throwing a huge party, these 2019 Super Bowl recipes are all you need for an awesome football party. You can’t have a football party without buffalo wings! These buffalo chicken sliders from Randi give you all of the taste of buffalo wings but are much easier to eat. 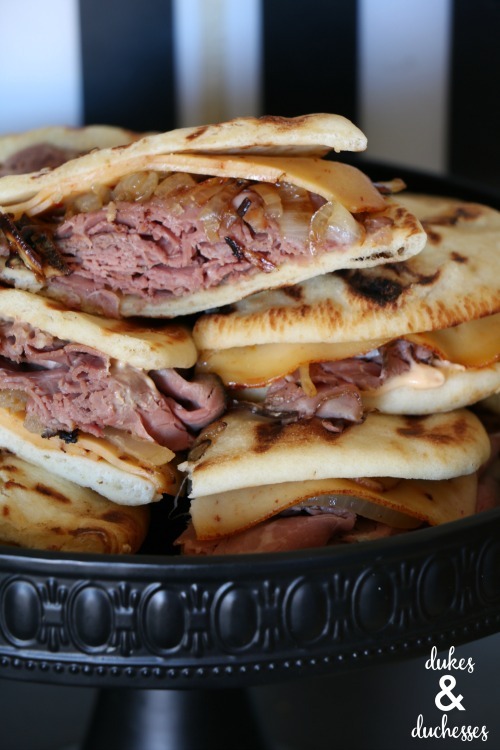 If you’re looking for a one-of-a-kind sandwich for your Super Bowl party, you can’t go wrong with these roast beef chipotle naan paninis. With deli roast beef, caramelized onions and chipotle spiced cheese, these are delicious and easy to eat with one hand, making perfect for a big Super Bowl 2019 party. Nachos are a football party staple. 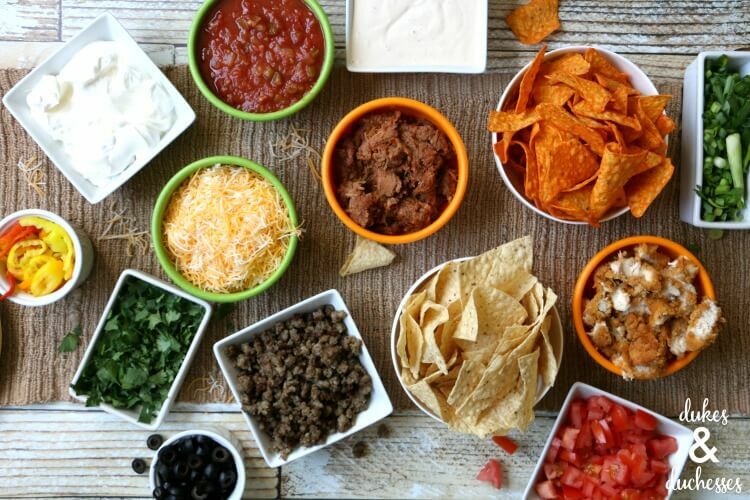 If you’re looking for a way to let each guest customize their own nachos, set up this nacho bar and let your guests design their own nacho plate. 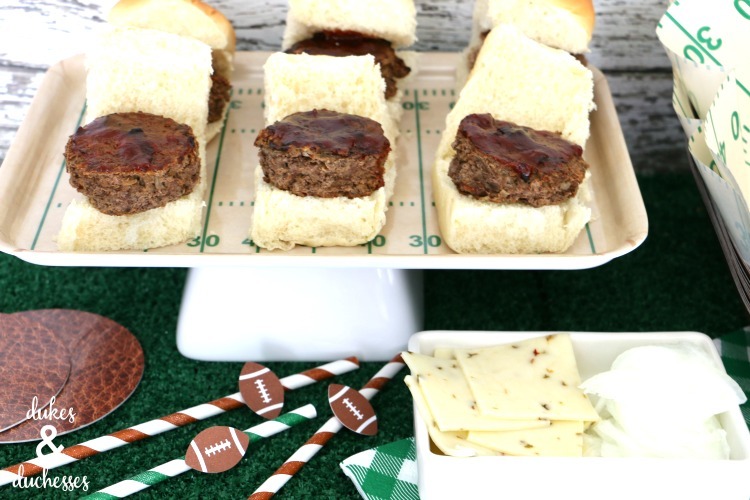 These meatloaf sliders are a twist on the basic hamburger, but these sliders are anything but basic! Bet you can’t eat just one as you cheer on the Los Angeles Rams or New England Patriots! 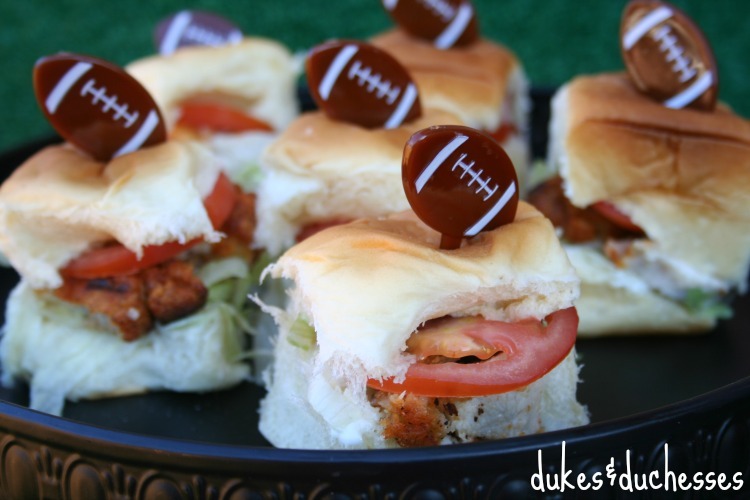 These mini meatball subs are ideal for a big football party where there are lots of other snacks. Although they’re small, they’re packed with flavor. 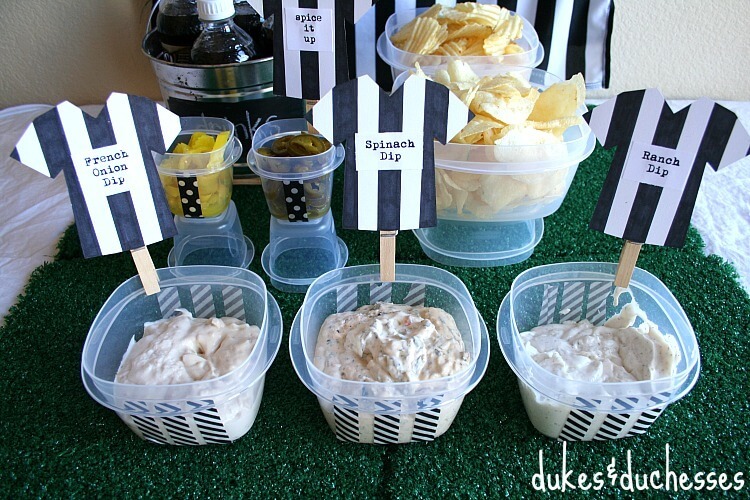 This chip and dip station uses black and white striped washi tape with cut out referee shirts to let your guests know just what type of dip is in each container. Eat up and enjoy! There’s nothing like fresh, homemade guacamole! This guacamole recipe from Tammy is sure to please, even the pickiest football party crowd. If Super Bowl LIII has a signature dip, this might just be it. It’s cheesy and full of chili goodness – you might want to make more than one batch! If you’re looking for a twist on jalapeno poppers, these bacon wrapped jalapenos can’t be beat. They’re stuffed with cream cheese and wrapped in bacon for a snack that packs a punch. Need a few recipe ideas? 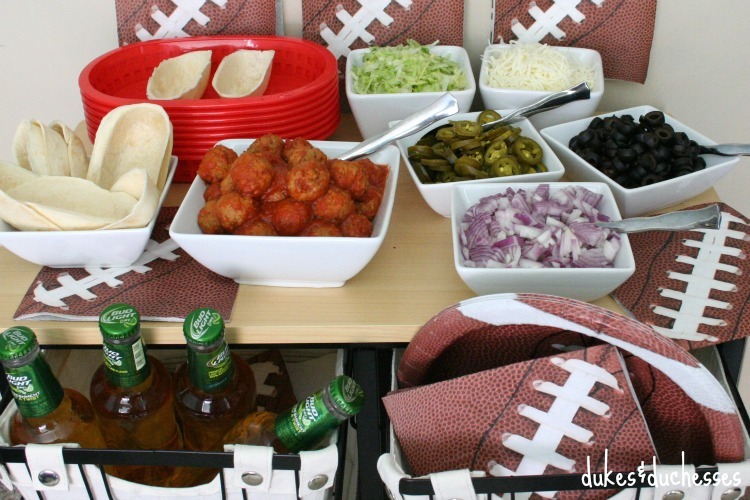 This round up by Tammy has everything you need to throw a great 2019 Super Bowl party. Grab and go snacks are perfect for football viewing. If you’re looking for something on the healthier side to snack on during the Rams vs Patriots game, these snack cups are the perfect solution. Fill small cups full of veggies and a little dip for a grab and go snack. Pretzels and popcorn are easy additions to your football party snack spread. This bar is full of toppings to spice up your popcorn. If you think baked potatoes are boring, you’ve never seen this Super Bowl LIII baked potato bar from Mariah. Bake up some potatoes and then have a variety of toppings available so guests can style their spud any way they’d like. Spice up plain popcorn by adding buffalo ranch spices. Bet you can’t eat just one cup! If you need something a little more substantial than chips and dips, these brisket sliders with spicy jalapeno coleslaw are a great addition to your football spread. These chopped tater tots are a fun alternative to the everyday potato skins. Top them with a variety of toppings so you can create an unique snack for your guests. No jarred salsa here! This chunky game day salsa by Michelle is delicious and full of flavor. 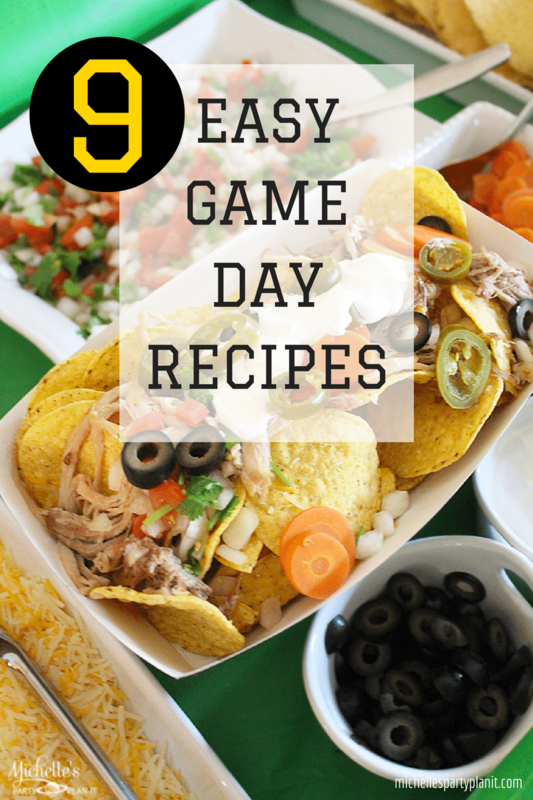 This roundup of game day recipes by Michelle has everything you need to throw a Super Bowl LIII party. This bean and corn salsa is a delicious alternative to tomato based salsa. It’s delicious and refreshing served alongside your favorite tortilla chips. Candy covered chocolates in team colors are the perfect way to match this head to head popcorn snack with the teams playing in the big game.